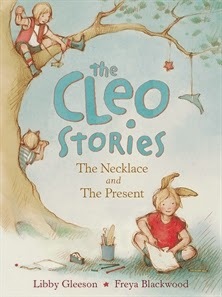 The Cleo Stories: The Necklace and The Present is a two-story illustrated book for younger readers written by Libby Gleeson, illustrated by Freya Blackwood and published by Allen and Unwin, 2014. It has the distinction of being chosen for the CBCA’s Book of the Year Awards 2015 in the Younger Readers category. Cleo desperately wants a necklace. Her parents say special presents are only for birthdays...but Cleo doesn't want to wait. In the second story, it's her mum's birthday and Cleo doesn't know what to give her - until she has the best idea of all. Delightful, warm and irresistible, these stories show how a little girl with a big imagination can always find a way to have fun. Libby Gleeson and Freya Blackwood have collaborated on a number of much-loved and award-winning picture books, including Amy and Louis and Clancy and Millie and the Very Fine House. The characters and situations in The Cleo Stories are all ones kids will relate to, and Blackwood certainly plays her part in bringing them to life. We see Cleo interacting with her family and friends, brainstorming ways to solve problems for herself, and also getting into a pickle. Cleo herself is a memorable character I know kids will enjoy. I defy any reader or read-alouder not to react to the final page of both The Necklace and The Present without a huge grin of delight! This is a gentle book, perfect for kids 6+ who are graduating from shorter picture books. It also makes fine read-aloud for parent/child sharing or for school. There are lots of issues to discuss with children - friendship, giving and receiving, acceptance, wants versus needs. Both stories celebrate children’s imaginations, and help support kids on the pathway to becoming completely independent readers. Find more Children's Book Reviews on The Book Chook by clicking Reviews in the right sidebar. Explore ideas for encouraging literacy and creativity with kids during Children's Book Week this year in Activities for Children's Book Week 2015.